For my slider menu, we had cheddar & bacon sliders, Italian sausage with onions & peppers sliders, vegetarian black bean sliders and these buffalo chicken sliders. They were presented in a tiered stand which was commonly used to serve cupcakes and made quite a presentation at the table! Served with slider toppings on the side and with other salads, the slider menu was a hit and a meal both kids and adults enjoyed. 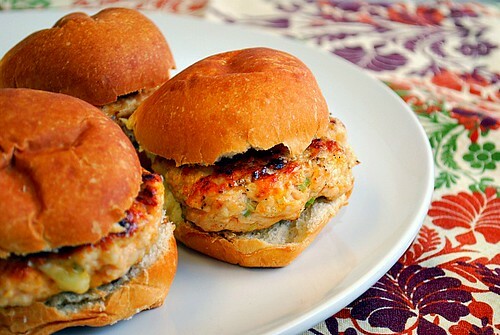 For these chicken sliders, it's important that you allow the meat mixture to chill so that they hold their shape when cooked. I adapted a recipe from Rachel Ray where all the flavors and common ingredients are combined with the ground chicken. For ground chicken, I used slightly frozen boneless, skinless chicken breasts which I pulsed down in a food processor to a medium grind consistency. You can also use ground turkey if you wanted as well. Combine all the ingredients except the buns in a large bowl. Form 10-12 large meatballs and transfer them to a plate. Cover with plastic wrap and chill for at least 2 hours. Heat up a grill or large skillet with oil. Place a few meatballs on the grill/skillet and flatten down to 3/4 inch thick. Cook for 5-7 minutes on each side. Place on bun bottoms, top with preferred toppings and top with other bun half. Yum! I love that this uses ground chicken instead of thighs or breasts. Pack that flavor IN! GREAT Party idea, love all the little treats and small enough that you can have one of each! I really like this slider idea. I have a hard to making up my mind on many things, so creating a variety of sliders would work well for me. I'm a huge fan of buffalo chicken as well, so this recipe sounds delicious! Oh yum, I love the flavours! These look really great! I like the idea of a slider "bar"...give everyone some variety. Very nice good for parties.Wonderful! Was my favorite slider! Yummy!!!!! 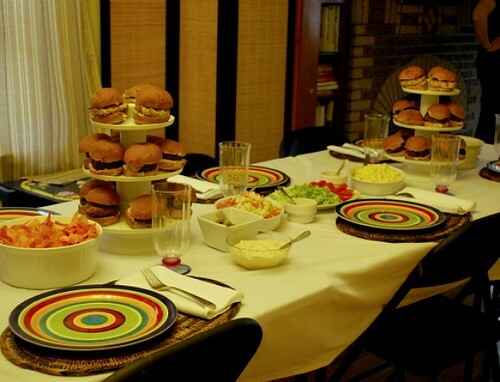 The lovely table setting certainly gives you a good idea of the size of these sliders. I want to try these this week because I know my hubby will love them and of course, I will too! Thank you for sharing it! Can I use BBQ sauce instead of Frank's Red Hot?